Book Online Lessons	Book Now! Why Take Online Lessons From Music to Your Home? Starting on-line piano lessons in my 40’s seemed like a daunting task, but Fabio made it easy and fun. He is an excellent teacher, both supportive and challenging, and within a short while I was making real music and had a working understanding of the basics of music. I couldn’t recommend Fabio more! 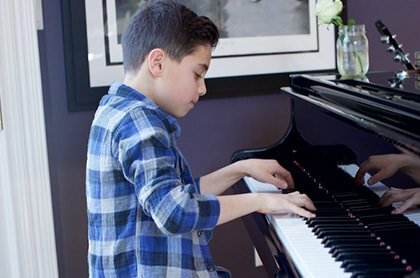 Recently, our son started online lessons through Music to Your Home with a very accomplished and talented musician who travels a lot playing music. Having the ability to connect with him, using FaceTime, has allowed our son to have access to a professional musician to continue his music education. We are very happy with the convenience and quality of the lessons. Music To Your Home works with some of the most talented musicians in New York City and now we are able to share our incredible teachers with clients all over the world through our live online lessons. We have a unique in-person hiring process. We provide 24-hour customer service. We offer quick response time and scheduling. Scheduling online music lessons is easy and convenient. Our clients can pick the instrument they want to learn, select their teacher, schedule their lessons, and pay online. We work with the most talented musicians and music educators in all of New York City. Our in-person hiring process ensures that we offer our clients the very best. Our teachers have performed around the world with groups like the New York Philharmonic, the New York City Ballet, and countless Broadway plays. Many of our teachers are chart-topping pop artists that have been heard on TV, radio, film, and have recorded their own albums.